Fixed reflector SLR camera. Automatic exposure - needle zereod in finder. Canon lens FL 50mm f1.4 Serial No 21481, bayonet interchangeable. FP shutter, metal blinds. Serial No 119261. Pentacon Six single lens reflex camera for 120 roll film, Made by VEB Pentacon, East Germany, 1965. Serial No 11723. Canon AE1 35mm single lens refelx camera body, partially dismantled. Cut-away section through body (no lens). Werra-matic camera. Carl Zeiss. Coupled rangefinder; built-in meter; needle vissible in finder. Zeiss Tessar 50mm f/2.8 No 7081381. Prestor RVS shutter. No 647981. Black covering. Werra camera. Carl Zeiss coupled range-finder; built-in meter, scale on camera top. Tessar 50mm f/2.8 lens No 5796841. Black covering. ERC. Box number 5, containing; Polaroid 600 SE Mamiya camera with Polaroid film back; Spare Polaroid film back; Polaroid Cold-clip for development in low temperatures; Ground Glass Viewing Back for Polaroid 600 SE; Mamiya 150mm f 5.6 lens for Polaroid 600SE camera with back and front caps; Mamiya 127mm f4.7 lens for Polaroid 600 SE camera with back and front caps, and rubber lens hood; Mamiya 75mm f5.6 lens for Polaroid 600 SE camera with back and front caps, and rubber lens hood; Focusing magnifier with hot shoe fitting for 600 SE Roll Film Adapter for Polaroid 600 SE camera (see notes below). Part of Shirley Beljon "Time Capsule" collection. 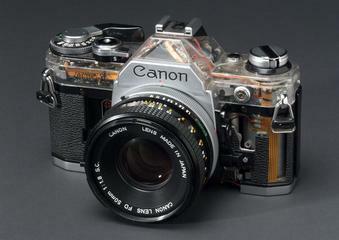 Canonet camera. Canon Camera Co Inc, Tokyo, Japan. Coincidence type coupled rangefinder camera for 35mm film 24x36mm. Canon SE lens F:45mm f/1:1.9. Plastic lens cap. Copal-SV shutter 1/sec to 1/500 sec. Electric eye control of aperture. Direct vision brightline finder with rangefinder and aperture indication. Coaxial flash socket. Lever wind. 1963. Serial No 1197023. With ever ready case, carton and instructions etc. Ilford Sporstman 35mm camera; Serial No 157285; 24x36mm; Dacora Dignar lens F:45mm f/3.5; Prontor SVS Shutter (Vario?) shutter 1/25-1/200; direct vision optical finder; accessory shoe; coaxial flash socket. Kamerwerk Reutlingen. Made in West Germany. Primarflex reflex camera, about 1936. Single lens reflex camera for 120 rollfilm 2 1/4 x 2 1/4 inches, 6 x 6cm. Fitted with a Zeiss Biotessar lens F: 16.5cm f/2.8-32, Serial No 2696839, in helical focusing mount. Lens tube with tripod socket. Focal plane shutter 1/2/5/10/25/50/100/200/500/1000/B/T - single knob setting which also winds on film, drops mirror and winds on counter. Removeable rollholder in camera back, pressure frame removes to permit use of single metal. Manufactured by Curt Benzin, Gorlitz. Camera No 25_830. Nikon F401 AF camera. AF Nikor lens 35-70mm, 1;3.3-4.5. Made in Japan. Built-in flash. Alpa 11 el camera, Serial No 58618. Kern-Micro-Switar lens, f/1:1 9/50, Serial No 1112941. With plastic lens cap. Contax III SLR camera, Serial No 70813 (back), F41538 (body). Built-in flash. Zeiss Ikon shutter. Carl Zeiss Tessa lens Tessar 1:2.8 f=5cm, Serial No 1534383.